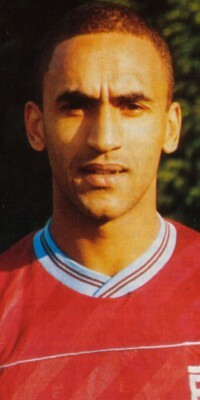 George Oghani signed for Burnley in the summer of 1987, one of a number of Brian Miller signings that followed the Orient game. Oghani had started his career with Sheffield United before moving on to Bury. He failed to break into the first team at either club and with no takers in league football he dropped into the non-league with Hyde United. He had an outstanding season with Hyde in 1982/83 and that prompted a number of league clubs to take a look at him. Bolton were the club who made their move and they took him to Burnden Park in October 1983 for a £5,000 fee. It was three months before he broke into the first but he showed signs of things to come during the remainder of that season. Partnering Tony Caldwell, another non-league find for Wanderers, he had an outstanding 1984/85 season. He scored no fewer than sixteen league goals that season and that included two at the Turf although the game was won 3-2 by the Clarets with goals from Kevin Hird, Neil Grewcock and David Miller. A year later his goals helped Bolton to Wembley in the Freight Rover Trophy but as the team's form dropped so did Oghani's. He was loaned out to Wrexham in March 1987 but it was still a big surprise when he was released at the end of that 1986/87 season. He'd scored no less than 27 league goals for Bolton, enough almost to reach legendary status at Burnden Park. But once free Brian Miller made his move for him and what a decision that proved to be as the goals went in during the 1987/88 season. George scored a total of 19 goals for us in that first season. Amongst them was the goal at Preston in the Sherpa Van Trophy on the night we reached Wembley. That goal was voted 'Goal of the Season' by members of the Supporters' Club, George becoming the first ever winner of the 'Keith McNee Trophy'. It wasn't the one he picked out. In an interview some years later he considered his goal at Norwich in the League Cup to have been his best. He played a massive part in Burnley's much improved season which ended with us comfortably in the top half, and that was a relief after what had happened a year earlier. Nineteen goals, one that helped us on the way to Wembley, but he's still probably best remembered for an incident in a DIY store that led to an arrest and an association with ironing boards. George was buying an ironing board but attempted to steal a bag of screws. Detected by security shall we say he used the ironing board to defend himself? Even at Wembley there were special George Oghani t-shirts with him emblazoned across the front with an ironing board. His second season at Burnley never reached the same heights and he found goals a bit more difficult to come by. The team didn't do just as well and one Burnley director of the time, the late Bernard Rothwell, put it all down to the fact that Oghani wasn't scoring as many goals. That was far from the case. He was now playing alongside Brendan O'Connell and the pair struggled at times due to the lack of opportunities created. Even so, George was still very much first choice in the side, that is until April 1989. By then we had a new manager. Miller had been replaced by Frank Casper and that wasn't good news as far as Oghani was concerned. He'd had great respect for Miller but struggled working with Casper. One Saturday in April we travelled to Grimsby. Alongside me on the coach was Burnley Express Sports Editor Granville Shackleton who told me Oghani had been ruled out of the side, as had goalkeeper Chris Pearce. In Oghani's place came David Jones so it was no surprise we lost and failed to score that day. Oghani wasn't injured or ill however; he'd been suspended by the club following a training ground incident that was widely reported to have caused Pearce a facial injury. George Oghani was never to play for Burnley Football Club again. From Burnley he played briefly for both Stockport and Hereford before signing for Scarborough where he had a good season and a half. He was released in 1991 and moved to Cyprus where is spent a season with Evagoras. On his return to England he signed for Carlisle and almost immediately found himself playing a starring role as the Cumbrians surprisingly beat the newly promoted Burnley in the League Cup. His league career ended at Carlisle and he had just one more season back in non-league football with Northwich Victoria and Guiseley before hanging up his boots and moving into the financial industry as a mortgage and investment advisor. He was one of the players who, for a year and a half, lifted us from the gloom after the Orient game. He was a popular player with the Turf Moor crowd just as he'd been at Bolton. But the off field incidents overshadowed his football and his time at Turf Moor was shortened, making room for such as John Francis and Ron Futcher to come in during the following season.